You are here: Home / Living Pretty With Your Pets / Living Pretty With Your Pets: The White Buffalo Styling Co.
First of all thank you so much for all your awesome comments on my hallway makeover. I so appreciate it. And et me tell you it started a gigantic storm in my head to redo everything in our house. I can’t stop thinking about what to do next. Well, it’s also Friday again and time for a second “Living Pretty With Your Pets” post. I think the first post was a hit with my non-blogging readers, so here is my second guest. 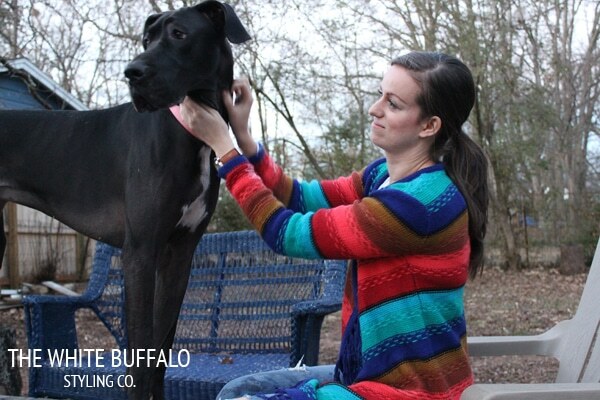 I’m so happy to introduce you to Lindsay from The White Buffalo Styling Co. and her pup Gracie. Lindsay is an amazingly talented and beautiful young lady and I adore her. She is generous and one of the nicest people you could think of. Did you see her house get crashed on Young House Love? 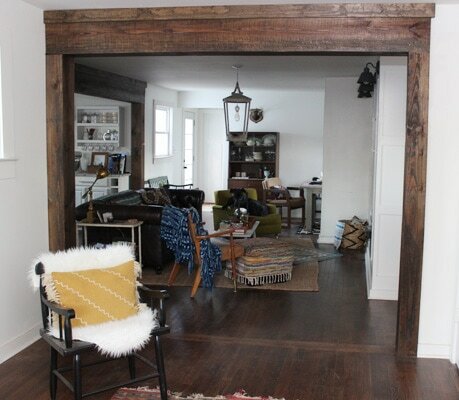 Well make sure to head on over to her blog to check out their amazing house remodel. I’m telling you it’s so unique and amazing. Hey y’all! I’m Lindsay from The White Buffalo Styling Co. When my good friend, Julia, asked me to be a part of this series, I was thrilled! 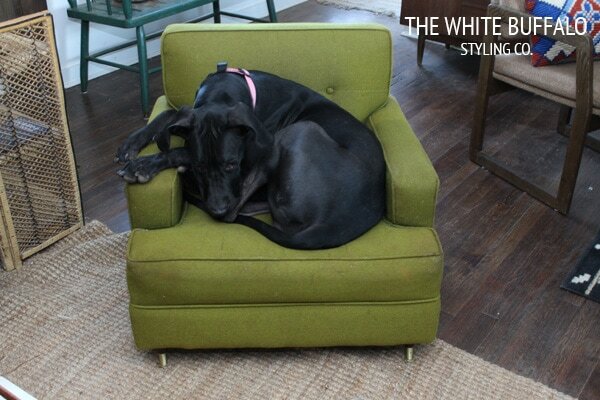 I am passionate about styling and design, but they barely hold a candle to my Gracie. 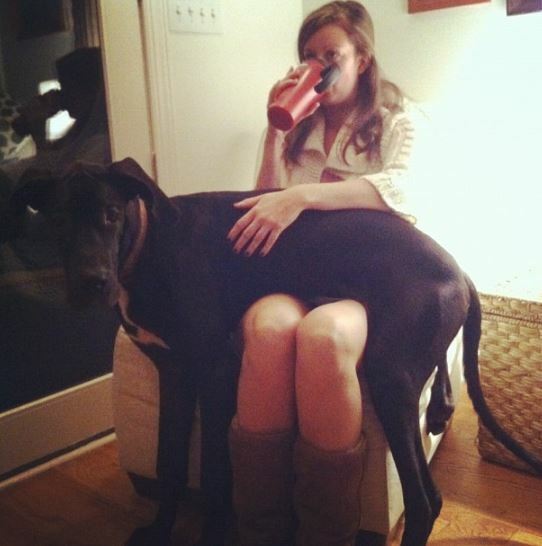 I am hear to talk about life with a giant dog, but have to preface this post with a little history. Growing up, I was terrified of dogs. I’m not talking, “Ooh, he looks a little scary. Maybe I won’t pet him.” I’m talking about tiny little white fluffy dogs that looked like teddy bears. Any dog sent me crying and screaming for mom and dad. As I got older, that extreme fear died away, but I still was pretty uneasy around them. I’m not sure where this fear and uneasiness came from, but early on in our marriage, Chris made it clear he wanted a dog. After much researching and checking out the qualities I knew we’d want in a dog, the choice was clear. 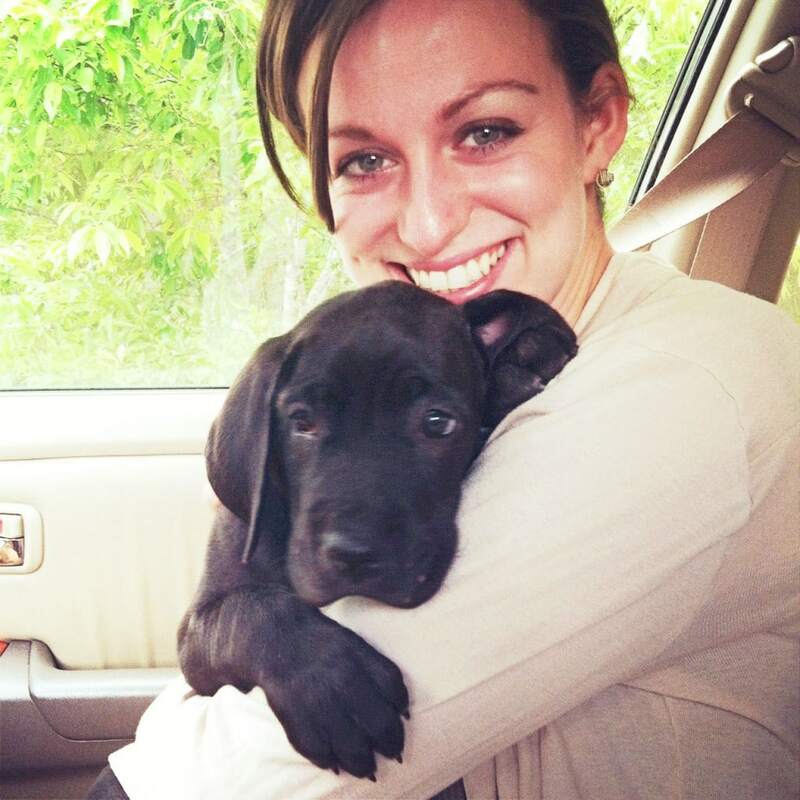 After much prodding from my husband, I came home one day and told him that I’d found a dog I wanted. He was shocked and quickly asked what kind. I told him I wanted a Great Dane. He was shocked at first. The girl who was terrified of Fluffy now wanted a Scooby. He hadn’t meant a dog quite so big. But after a year of researching, we went to bring her home. It’s really weird. I’d never bonded with an animal before. Obviously, I’d been terrified. But from the moment I scooped Gracie into my arms, she was mine. I cuddled her every chance I could, knowing that before long, she’d be hip height. 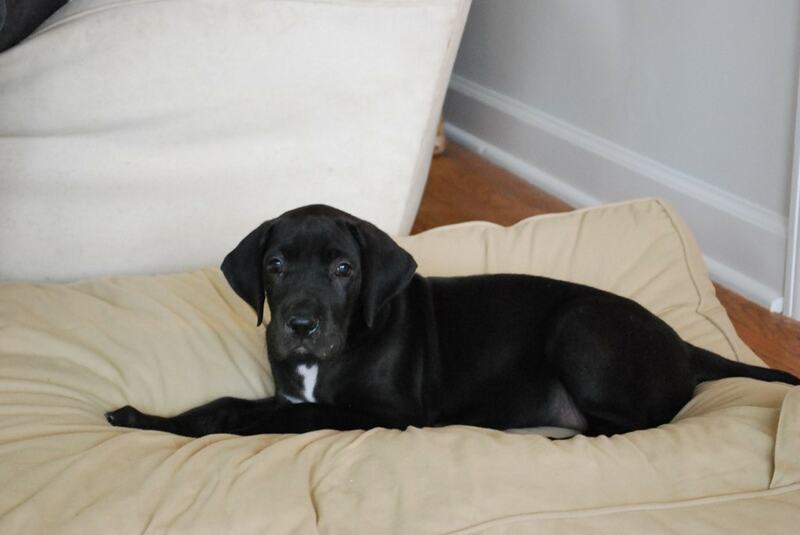 The picture above was the day we brought her home at seven weeks. Here she was just four short months later. There, she was half of her now final size. Now, Gracie weighs in at 102 pounds (petite for her breed) and her head reaches just above my hip. Gracie very quickly wedged her way into our hearts and lives. She has the biggest heart and the sweetest spirit. She can’t stand to be away from her people and is a lap dog. 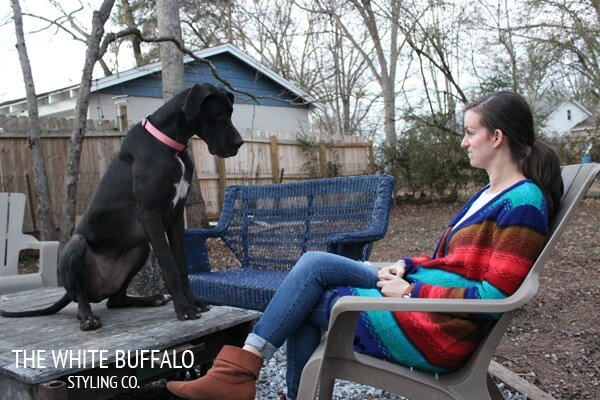 I know what you’re thinking…how in the world does that dog sit in your lap?! She has a great appreciation for mid-century furniture. This green chair in our living room was quickly claimed by her. She spends about 75% of her days cuddled into a tiny ball in this chair. She sneaks into as many of my photo shoots as she can. Do you spot her? If you look close at many of my photos, you’ll see a wagging tail, or some part of Gracie. I used to fight it, but now I just accept it. Cute pups make photos better, right? 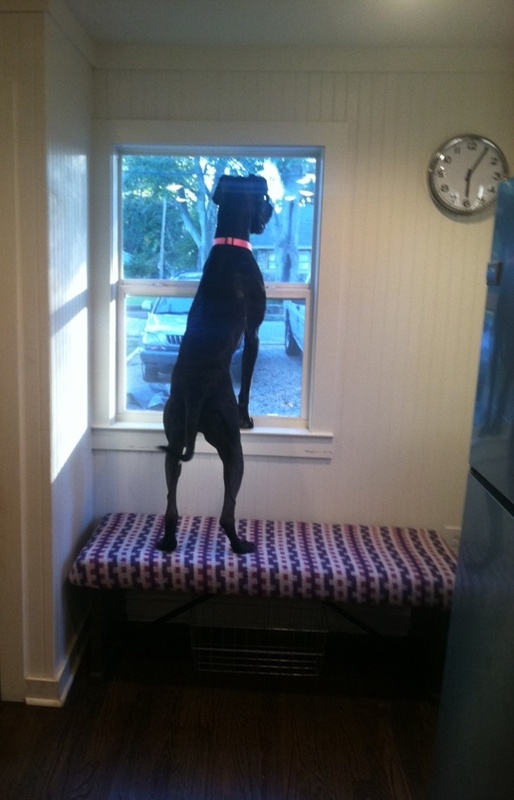 The first reason I chose a Great Dane was the security. Gracie makes sure everyone knows that she lives here. Much of the neighborhood is scared of her and thinks she would kill them if she got out. 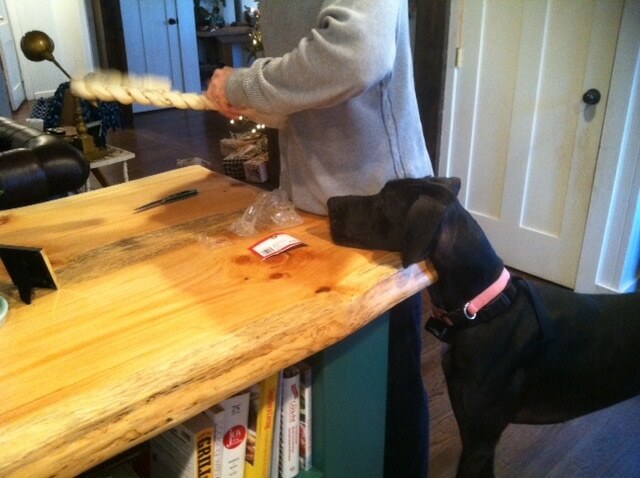 It’s interesting having a dog that can just rest her head on the counter tops or our live edge island. Good thing she’s trained and really obedient…most of the time. Gracie has decided that every project we do is for her. The new bench? A stool so that she can better say hi to all the nice people outside. The island? Useful chin rest. I’m certain it has nothing to do with being in close proximity to food. When I was making our new kilim bench, I laid out the blanket to cut and immediately, Gracie approved of it. We’ve quickly learned that “W-A-L-K” is a curse word in our house and must be spelled out unless we MEAN IT. When we hang out in our backyard, Gracie has a special spot. Yes, she sits or lays on the coffee table because she just isn’t tall enough without it. I mean, she needs to see us eye to eye, right? She cracks us up every day. Who knew a dog could make life so interesting? Sure, she sheds some with her fine, short hair, but nothing a little vacuuming can’t fix. She can get things off the counters. She can quickly ruin a door if she decides it’s time for scratching. But more than any of that, she just brings so much joy into this house. I know that sounds cheesy, but there is nothing like coming home at the end of the day and having her run to you and immediately “sit in your lap” to be petted. She loves us and always wants to be near us no matter if we’ve been too busy to play. Grateful for all of the playfulness and love, but most importantly, I’m grateful because she’s made me brave. Having her has shown me that when I face my fears, there can be something wonderful and beyond anything I’d imagined on the other side. I love my big, special girl. (Yes, she’s standing on the coffee table above). Oh, and Gracie said to make sure I ask all of you to follow her at #greatdanegracie (@thewhitebuffalostylingco) on Instagram. She makes sure to post all of her shenanigans and cuddly cuteness there. Love Lindsay and Gracie’s story, don’t you? And did you get a glimpse of their gorgeous home? The kitchen is so amazing. Go check it out. Thank you so much for having me, Julia!!! I loved sharing about our Gracie 🙂 And I ADORE your cross wall. It is so graphic and awesome! It really looks great. Thanks Lindsay! Loved having you here and Gracie looks like the perfect companion. Her face is so sweet and loving. Julia, I love this series and The White Buffalo! I want to meet that Gracie 🙂 She is too funny! 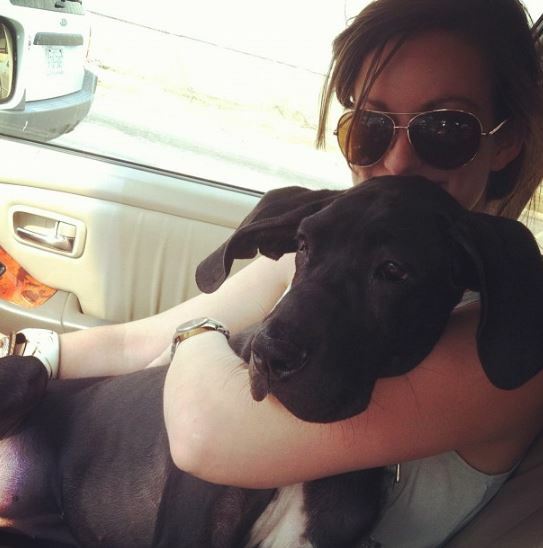 suddenly i want my next dog to be a great dane- she is so beautiful and sweet and the lap picture sold me! Cassie, they are seriously the best. And they are playful, but considered very low energy so she really lays around a lot. I always worried about having a dog in the house period, but having her has blown me away. She’s obedient, but really lazy so she isn’t too much of a handful. 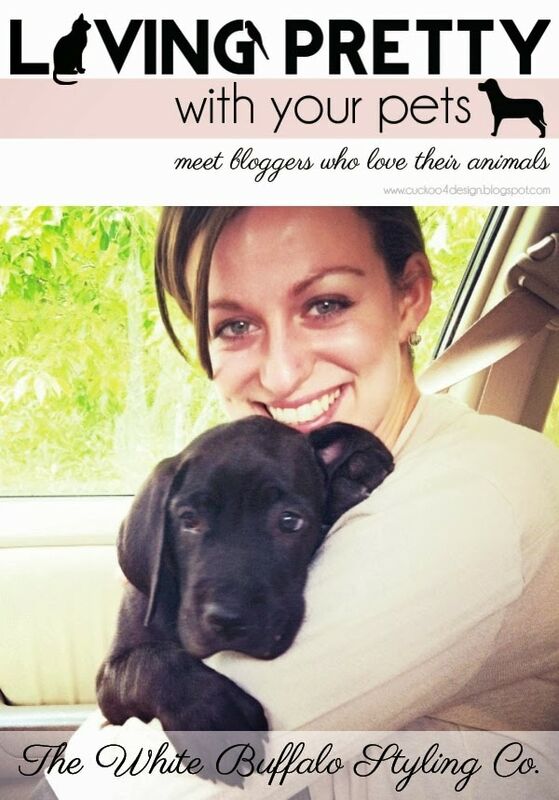 This post just touches my heart and makes me miss our sweet dog, Misty! We are looking into adopting another rescue very soon as our house is just so empty without a dog. Pets are just the best! This series is so great, Julia! And I loved getting to know more about that special pup!! PS-I’m pretty sure Perny thinks most projects are for him too HA! OMG Gracie is a beast in the most amazing way!!! What a sweet dog, love her!!! I love this series Julia! Keep em coming!!! she seems like a sweetheart! i love how gentle those pups are, big snuggle bears!! I love dogs! 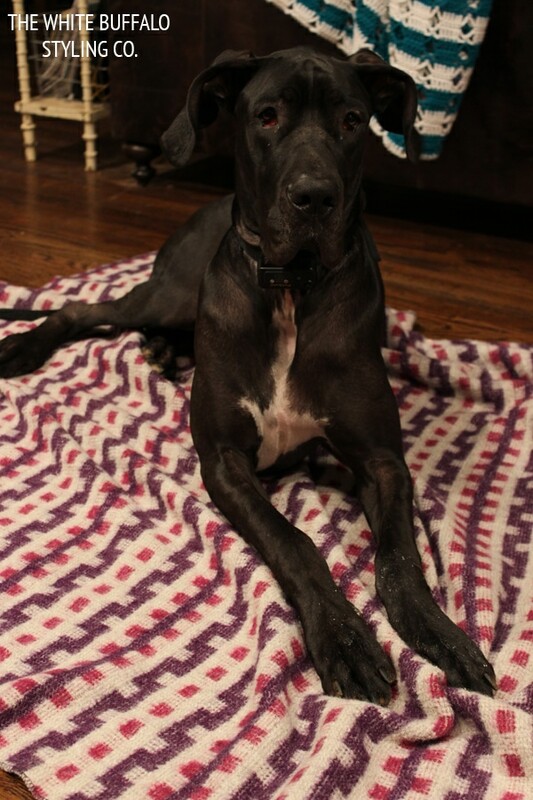 My last big guy was part Dane and he was great. I love this! Love how she “sits” on her lap too. too cute! This is such a sweet post. Gracie is so lucky to have such caring owners. Love that pic of her looking out the window! Wow, did you make a winning choice!!! 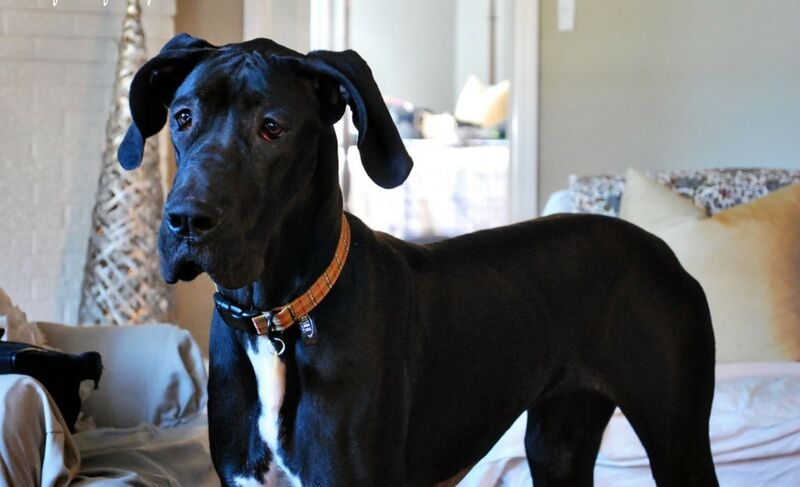 Great Danes are the most kind, sweet, gentle, lovable, wonderful dogs I have met……. I LOVE them. Gracie is just gorgeous! You are a lucky, very lucky girl. in fact I will go so far as to say that God surely loves you….. you chose Gracie. I’m so glad you like Gracie’s story Bette and it sounds like your Jovi is just as sweet.